This is about the time in the summer when I start to note fall trends. Before the summer officially comes to a close I will browse a few of my favorite stores and add to my already brimming closet. I don’t need much, but infusing some new colors and patterns can make an old wardrobe seem fresh and new again. Even though I really shouldn’t purchase any more dresses (my last job was working in fundraising for a law school where I attended lots of events that required professional attire – needless to say, I have amassed quite the collection), I just can’t help myself when I find great dresses that can transfer from season to season. Case in point: over the weekend I found myself stopping in at The Loft. I told myself it was only to check out the sale section, but I have no self-restraint. Within minutes I was surveying the petite section, arms full of clothing that I deemed worthy to make it to the dressing room stage. My eyes were immediately drawn to a new color and style for me – a golden mustard floral piped shirtdress. I loved the unique color, light texture and collared look. Did I mention it has long sleeves? It is perfect for a cool fall day at the office and could easily be paired with tights. A few more purchases like this and I will be ready for fall, and maybe not so sad to say good-bye to summer! And of course, the whole reason for my trip in the first place, and the final stop on my browsing tour – the sale section. On the first rack, I spotted an adorable romper. I’ve been kind of late to adopt this trend, but after this purchase I think I am hooked. 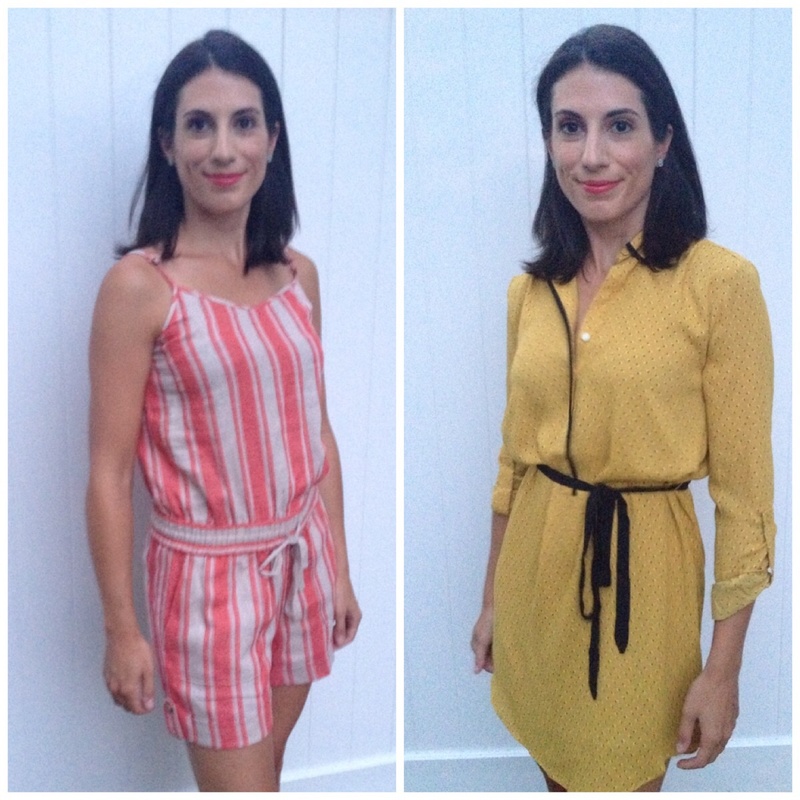 This coral-striped spaghetti-strap romper is perfect for the final days of summer. It’s so comfortable and can be dressed up with a pair of wedges or worn with flats for a more casual look (I might even wear it out to The Hampton Classic!). The best part – it was 50% off the original price. If they had it in other colors, I would have come home with more than one.